The new Free FanChants app plays over 10,000 real football chants recorded from fans of 500+ teams from all over the world. FanChants.com receives hundreds, sometimes thousands, of audio chants monthly from soccer fans all around the world so the archive just keeps growing. 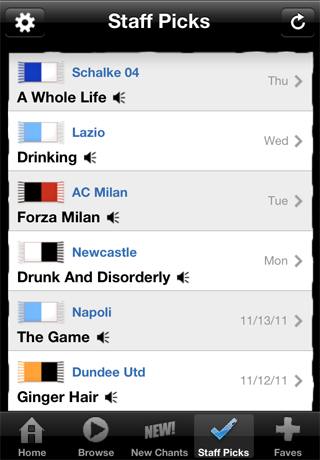 Users register their favourite team within the app to be notified of new chants that are hot off the press via push alerts. Staff Picks are a hand picked selection of the best chants from teams all over the world and are updated daily, giving fans a taste of terrace culture from other countries. For an upgrade fee of £4.99 all chants are available to use as ringtones so football fans are able to use any chants as profile tones for when their mates call. Different chants can be used for different people. 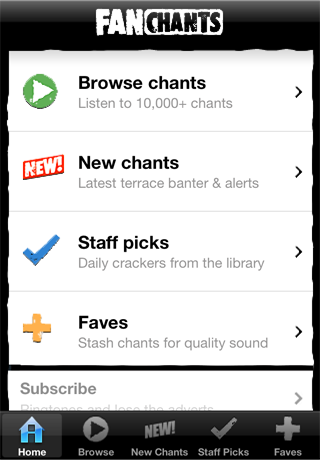 Chants like ‘You’ve never seen a salad’ are funny additions to ringtone libraries and for those mates who support different teams chants like ‘We all hate Leeds’ or ‘Build a bonfire’ can be used as profile tones. There’s laughs to be had and shed loads of chants to choose from. The new app lets iPhone users play and listen to all chants in a smart, easy way via their iPhone, as well as being alerted to what’s hot off the terraces – both at home and away.